This statistic depicts the revenue of the Unilever Group worldwide from 2005 to 2018, by product segment. 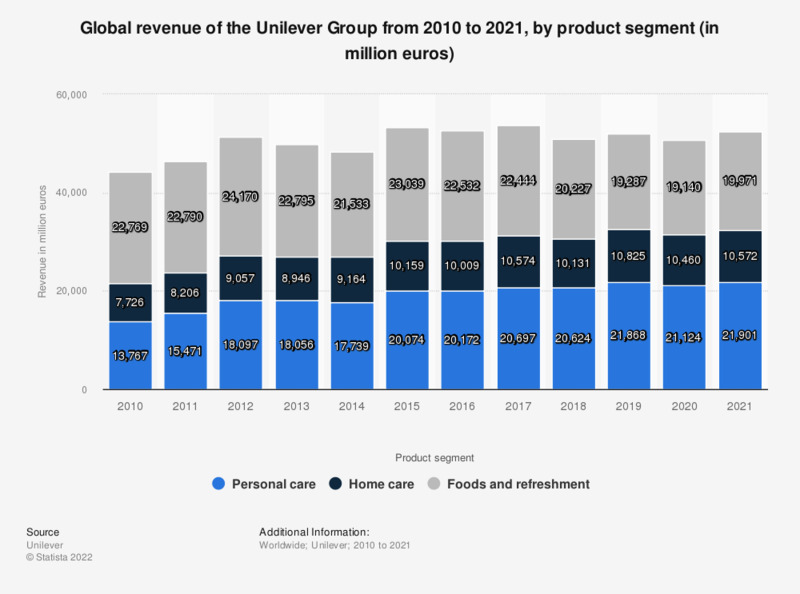 In 2018, the global revenue generated by the Unilever Group's personal care product segment was about 20.6 billion euros. Founded on January 1, 1930 by the merger of the British soapmaker Lever Brothers and the Dutch margarine producer Margarine Unie, Unilever is an Anglo-Dutch multi-national consumer goods company that produces food, beverages, cleaning agents and personal care products. In 2016, the Unilever Group had a global revenue that amounted to about 52.71 billion euros. The largest product segment of the Unilever Group is their personal care segment, which generated just over 20 billion euros in 2016. Unilever has a plethora of brands ranging from food and beverage to home and personal care; seventeen of these brands generate annual sales of one billion euros or more. Clinique is Unilever's biggest product brand and in 2016 it generated about 6.24 billion U.S. dollars. Unilever's largest international competitors are Nestlé and Procter & Gamble. Procter & Gamble, also known as P&G, is the biggest consumer goods company in the world. It mainly manufactures laundry and cleaning supply products as well as products in the cosmetics and personal care sector. The company's roots date back to the year 1837 when it was founded by William Procter and James Gamble in Cincinnati, Ohio, where the company's headquarters still remains. The earlier data were taken from older editions of the same source. As of 2018 report foods and refreshment segments were combined.